Enjoy a meal with a view at Atlantic’s Edge, our flagship Islamorada seafood restaurant that highlights the cuisine of the Keys. 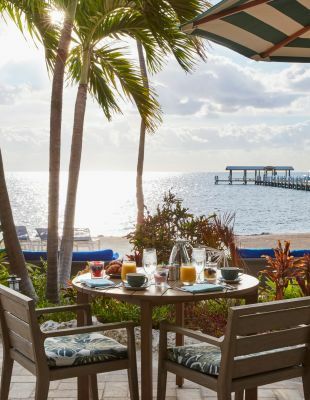 Offering indoor or outdoor dining with panoramic views of the Atlantic Ocean, our Islamorada restaurant is a culinary destination in and of itself. Atlantic’s Edge is a culinary journey through the Caribbean and Atlantic Ocean islands infused with local, fresh ingredients native to the Florida Keys. This chef driven restaurant is a modern take on island inspired cuisine that celebrates flavors, cultural influences and native cooking styles of islands from Islamorada to Cuba, Bahamas to Turks & Caicos. Menu highlights include; roasted red snapper with Dragon Fruit, Hibiscus Swordfish and Iberico Pork Roulade, all of which pair perfectly with an international selection of wines and unique craft cocktails. Overlooking panoramic views of the warm Atlantic ocean, Atlantic's Edge serves breakfast, lunch and dinner in a relaxed yet elegant approach to resort-style dining.